Agnes, who was on a business trip to Tokyo from Jakarta, requested Hub Japan’s BE A LOCAL service. As I communicated with her in advance through e-mail, I could feel how nice she is. She kindly accepted us to write an article about the night. The day we met was January 27. This was a day after a seriously cold week and got a little warmer. My company of the night was Yuji, a friend of mine from junior high school. It was his first time participating in BE A LOCAL service. 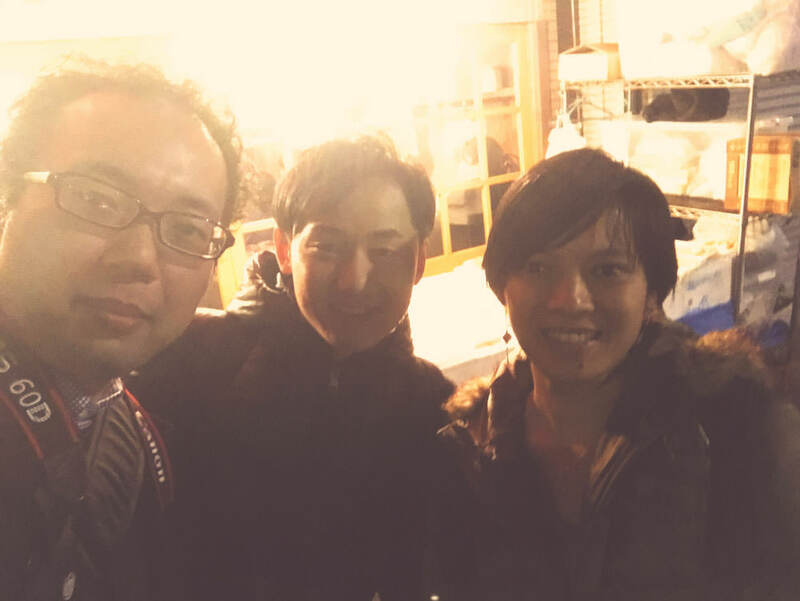 Agnes, Yuji, and I (cameraman) met at Tsukishima Station. By the way, Yuji was smart since he was a student and he often goes to business trips abroad now. He can speak English pretty well. I am a very old friend of Yuji, but I am not good at speaking English. My English speaking skill is about a Japanese junior high school student level. I was planning to rely on Yuji about communication. Of course, I was going to try as much as I can! This is the chance to test my daily English studying. My feeling towards the day was like that and waited at the exit of Tsukishima Station. We walked to the restaurant we had booked as we talked about each other. Agnes was in Canada for a long time, so her English was very fluent. Agnes cared about me not understanding much English. She told me “I am sorry, I am a fast talker.” She is really nice. All people I meet through BE A LOCAL are fabulous. Interacting with Agnes, who tried Monjayaki for the first time in her life! Agnes comes to Japan often because of her job. She had been to Japanese style parties with her teams, but eating Monjayaki was the first time for her. She told us that she found out about Monjayaki in Hub Japan and thought she’d like to try the food. That was the reason why she requested BE A LOCAL service. When I asked if she has tried Okonomiyaki before, she said she had few times, and Okonomiyaki is one of the foods she likes. The menu we ordered with Agnes, who said she could try anything, are Mentaiko & cheese Monjayaki and pork Okonomiyaki. Those two are the recommended dish from the restaurant. As for the drink, plum liquor with soda tends to be popular for travelers, so we recommended it for Agnes. Us Japanese guys ordered some beer. 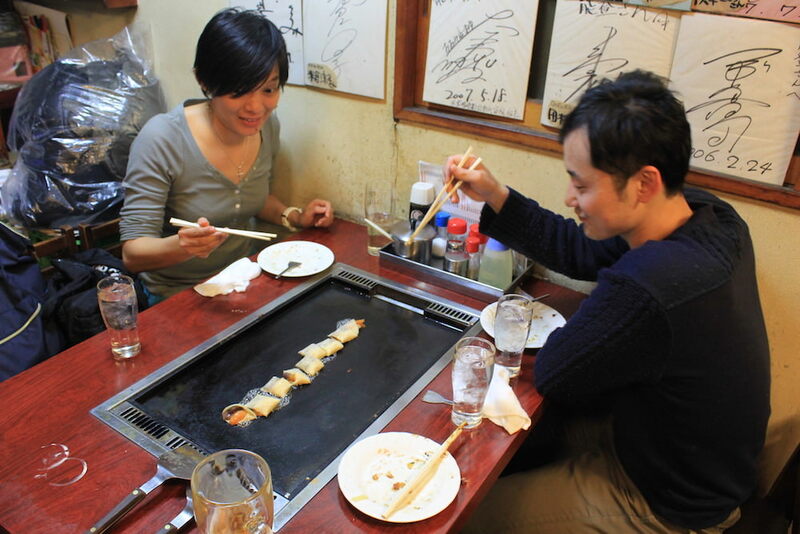 The place let customers cook Okonomiyaki and Monjayaki by themselves using the iron plate on the table. This style is maybe unique in Japan. 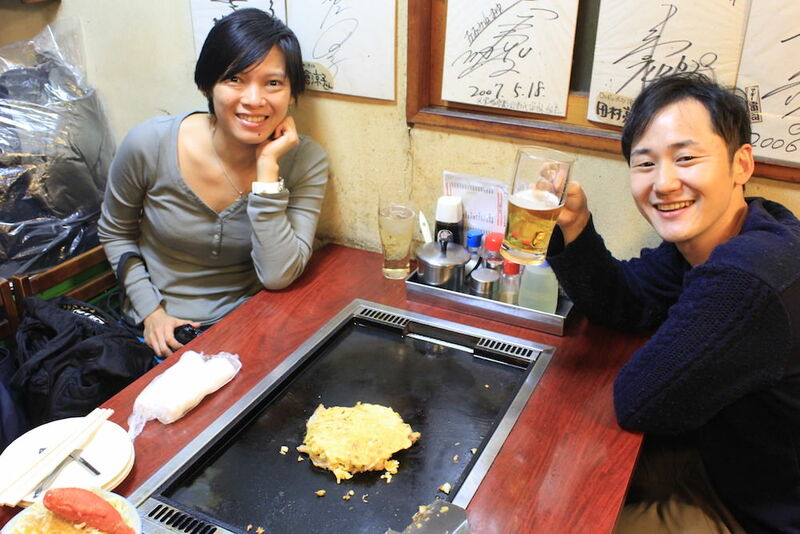 Of course, there are places which staffs prepare for customers, but for Okonomiyaki restaurant, this self-cooking style is standard in Japan. The chef of the day was me. My partner cooks the food usually, so I was a bit scared of the outcome, but with advice from the staffs, I tried to cook the food properly. As I cook, Yuji and Agnes talked about their usual life. I joined the conversation when I can. Yuji translated for me when I did not understand. I discovered that there are lots of spicy food in Indonesian food. I haven’t interacted with Indonesian culture much before, so I never knew about that. I learned about different cultures and lives through an individual. The conversation we can not have in daily lives is very stimulating. The first thing we made is Okonomiyaki. Agnes told us this was the best Okonomiyaki she has ever eaten. It makes me very happy when people like the food I prepared. Mostly this is the restaurant staff’s work, but I showed my proud face with some jokes. The next thing we cooked is Monjayaki. The most difficult part of preparing Monjayaki is making a wall of ingredients in the shape of donuts and putting dashi broth in the center. Agnes was gazing the food with interests. I explained how to enjoy Monjayaki with gestures. 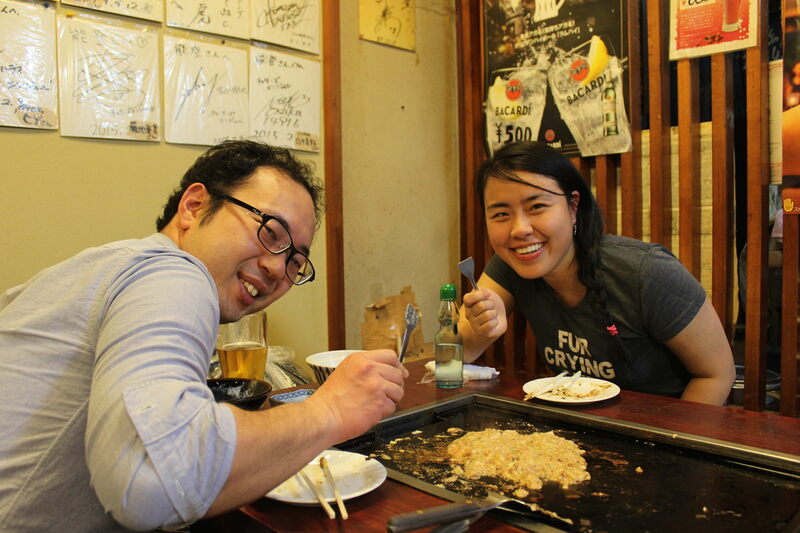 Agnes had a bite and told me “You are a good chef!”, I got the honorific title for Okonomiyaki and Monjayaki chef! Well, most of the achievement was restaurant staff actually. Agnes later told me that she is not good at eating spicy food. Mentaiko is a little bit spicy, so I was worried. However. Agnes gave me smiles as she ate Monjayaki and told me the food is good. Agnes is really a kind, heartwarming person. Red bean paste and apricot crepe (Anko-Maki) is a popular dessert at Okonomiyaki and Monjayaki restaurants. We can’t miss this as the dessert to finish the meal! This was a huge hit to Agnes! She seemed really happy and enjoyed the food. 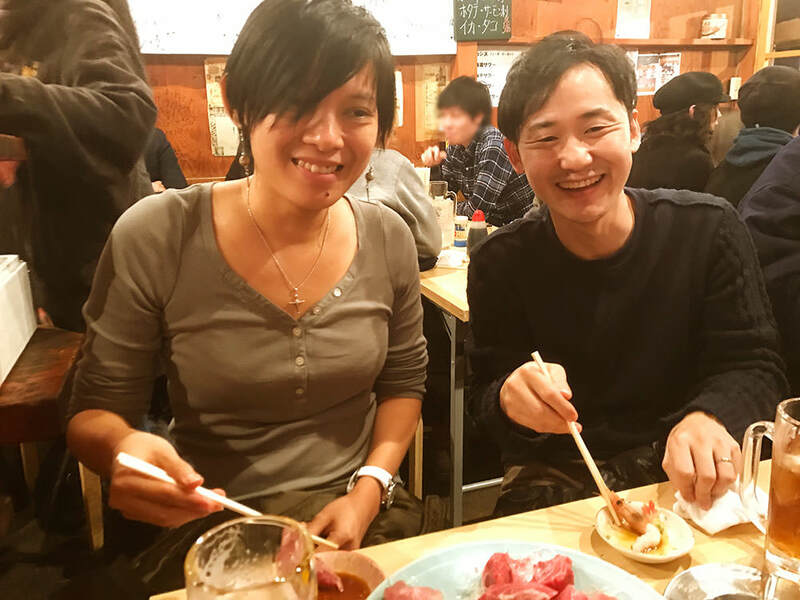 We wanted to talk more so we took Agnes, who told us that she loves sashimi, to a seafood Izakaya nearby the Okonomiyaki restaurant. Tsukishima is close to Tsukiji Fish Market so there are many great seafood Izakayas, too! This Izakaya is very authentic Japanese Izakaya with cigarettes smokes but their seafood is the best. I was worried if we could get in without a reservation and found the place was extremely crowded when we got there. But the staff told us that the seats would be available in few minutes. We decided to wait. We went in and ordered a sashimi platter and beer for each. Agnes told us this was the best sashimi she ever had in her life. We were sad, but it was getting late, so we asked for the bill. We took a wefie in the end. Agnes told us that this was a memorable day. I can’t quit participating in BE A LOCAL when I see this smile. Thank you for participating in BE A LOCAL, Agnes! We started walking towards the station but talking never ends. Yuji was going to the different direction, so Agnes and he shook their hands and said goodbye, promising to see each other again. The back of Yuji seemed very lonely. I was texting with him later, and he told us the night was very fun and it was a great chance to practice English for him. Agnes and I were going to the same direction. It was a challenging time for me who can not speak much English. Agnes looked like she was aware of that, and talked with slow and easy English. She talked with smiles with me even my English is very poor. We shook our hands at the station I had to get off. We spent only a few hours, and my English is poor. Even in that situation, I feel some loneliness to say goodbye. I got on the train as I waved my hand. Agnes waved until the train goes out of her sights. It was very heartwarming. On the next day, I sent her my Tonkatsu restaurant recommendations because she said she liked Tonkatsu. Love the food especially the taste and experience. First time I even saw Okonomiyaki and Monja cooked and prepared in front of me. The dessert is especially special and heavenly. Would recommend this to my friends. Thank you very much for making this trip a memorable one. She told me again in the reply e-mail that she truly enjoyed the night. We had so much fun, too. See you again sometime!